Twenty-five years ago sceptics told Andrew Clarke that it was impossible to establish a vineyard at Tonimbuk. Today Andrew and wife Abi oversee a thriving gourmet tourism business. The couple sat down with REBECCA SKILTON to talk about their sparkling success. 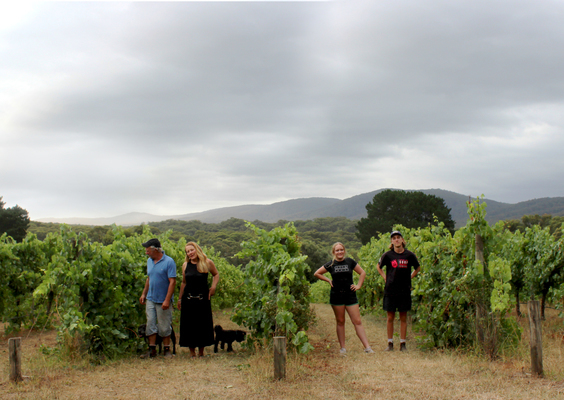 Nestled at the foothills of the Bunyip State Park is Andrew and Abi Clarke’s Jinks Creek Winery. Surrounded by the picturesque Black Snake Range, the Clarke’s 100 acres showcases the best Gippsland has to offer. Horses graze on prime agricultural land, while ten acres of thriving vineyards proudly line the property’s centre. A myriad of birdlife and Australian native animals wander through the property’s clearing, reflecting the Clarke’s largely organic philosophy. At the property’s heart is a 133-year-old shearing shed turned wine bar. Built near Whittlesea in 1875, the rustic shed was relocated to Jinks in 2008 and renovated to house a restaurant, art gallery and cellar-door. The unique and atmospheric venue is constructed entirely from recycled materials sourced from Gippsland. It boasts old lining boards, a kauri pine dance floor and beautifully preserved pressed tin ceiling. Perched above the vineyard with an exclusive view of the Bunyip State Forest, the wine bar boasts huge industrial steel windows, which overlook rows of prolific vines. Standing there, it’s hard to imagine the rows of grapes not flourishing. But when Andrew purchased the property from family in 1994, that’s exactly what he was told. “Everyone told me that you couldn’t grow grapevines here back when I did it,” Andrew said. “They said it was dairy country – that you can only grow grapes in Mildura. It was sort of pioneering because no one ever thought it would work and there weren’t any others around. But I knew it would be alright for grapevines because the property used to be an apple orchard. Andrew’s love for winemaking started young. While his grandfather was a Melbourne wine merchant, Andrew was the second recipient of a winemaking scholarship from the Victorian Wine Industry Association in 1979. His scholarship saw him work in Sonoma California for Dave Stare at Dry Creek and in South West France in the Bordeaux region at Chateau Giscours. When he returned home, he learnt from Australian industry icons such as Brown Brothers and Rick Kinzbrunner of Giaconda. Having produced wine since the age of 20, Andrew has long established himself as a leading winemaker. In 1984, he started working in the viticultural consultancy industry, setting up vineyards and overseeing their day-to-day management. This is an activity he still does today, overseeing around 10 vineyards across Victoria. In 1989 he started making wine under the Jinks Creek label from an old apple shed on the property. Andrew went on to sell his wines in top restaurants in Melbourne, Sydney and Brisbane, with export sales to New York and Singapore, and more recently, to both France and the U.K. He has received an array of outstanding reviews, including five-stars from James Halliday and reviews with marks over 90 by American wine guru Robert Parker Junior. In 1998, he met his wife and art-curator, Abigail Edwards, who would help expand the Jinks Creek name into the art world. “We met 20 years ago at my family’s gallery in Portsea,” Abi explained. “Mum has had galleries around Australia for 35 years – the same amount of time which Andrew has been making wine. After Andrew and I met, we closed the Peninsula gallery and I just decided it was a perfect situation where Andrew and I could bring our passions together. Jinks Creek Wine Bar, Gallery and Accommodation (as it’s known today) was opened in 2008. Located 10 kilometres off the highway, the Clarke’s were often told that they had little to no chance of enticing visitors to their doors. “People always said; how are you going to get people here? But we were never worried. We already had our reputation and we’re actually not that far from Melbourne. But still, a lot of people told us that no one would come out here,” Abi said. Today Jinks Creek Winery is an iconic Tonimbuk destination for hundreds of visitors each month. While Andrew continues to make his wine in-house (albeit in a new, larger shed), Abi runs the property’s B&BS, as well as hosting functions, weddings and monthly market days. However, her passion thrives through her popular Abi Edwards Gallery, which showcases artists such as Christopher Lees, Esther Erlich, Mark Knight and Janine Riches. While she believes that the gallery provides the perfect hub for artists, she also strives to provide visitors with a place to immerse themselves in the art world. “We feature lots of local artists – they have to be exclusive, iconic, quirky, unusual – in a niche of their own. I like artists who are doing their own thing; those we haven’t seen before – who put a twist on something,” Abi said. “Art is an acquired taste like wine – not everyone understands art or they’re worried that they won’t – but it’s really about your gut instinct. Andrew and Abi’s two children, Charlie (19) and Lucy (16), also play a role in the success of the business, the pair leading the kitchen when the wine bar and restaurant are open to the public on Sundays. “Lucy runs the kitchen and floor and manages the staff. She also does a lot of changes to the menu and every area of the restaurant really – she’s quite the innovator,” Abi said. Meanwhile, Charlie is a familiar face in both the kitchen and winery, cooking and working alongside Andrew. “Both Charlie and Lucy have got things on the menu that they’ve added in and they both make drastic changes when necessary because they both have clear visions that we can’t always see – so we let them go full-speed ahead with those ideas,” Abi said. In fact, one of the newest ideas encouraged by Charlie has been the introduction of the Jinks Creek Farm House Ale and Gippsland Cider. Having recently purchased machinery from Germany, Charlie and Andrew have been creating small batches of Belgium Farm House Ale. Made from scratch on the farm, the ale is proving to be a hit amongst customers at the wine bar and inner-city restaurants. “We saw a chance to make a bottle fermented, unfiltered Saison style beer with our own Gippsland rainwater that fits into our philosophy of artisanal produce,” Charlie said. But while the Clarke’s are always looking at ways to keep expanding the Jinks Creek name, there are some things that they admit will never change, such as their commitment to an organic, bohemian-themed lifestyle and support of the local Gippsland region. “We’re not for every person and that’s okay,” Abi said. “We’ve never advertised; we just seem to attract like-minded people. We’re bohemian, rustic and hand-made, which a lot of people from Melbourne are really searching and yearning for so I think that’s one of our secrets. “And we just think Gippsland is just an amazing region.